Modern house, with an area of ​​200m2. The land is 900 m2, complemented fenced. 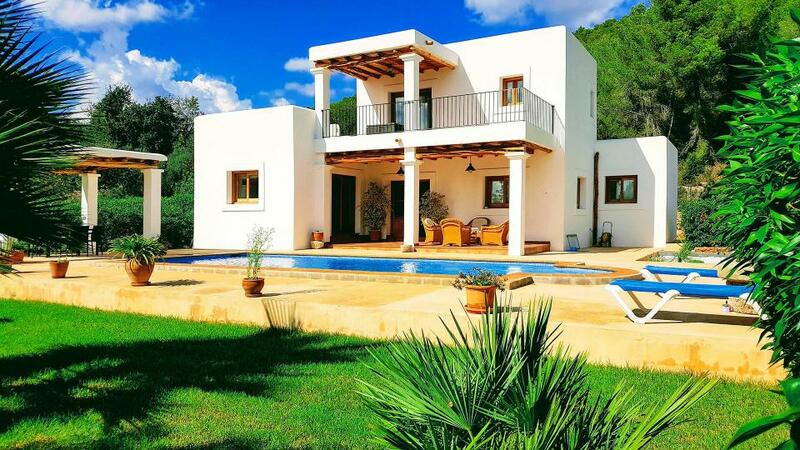 Very nice decoration that combines a modern and traditional Ibiza style. Beautiful sea views and Formentera. Room, Ground level, direct access to the terrace. This bedroom has 1 double bed 180 cm. Bathroom ensuite, With shower. This bedroom includes also air conditioning, TV. Room, 1st floor, direct access to the terrace, view of the sea. This bedroom has 1 double bed 180 cm. Bathroom ensuite, With bathtub, shower. This bedroom includes also air conditioning, TV. Living room and dining room, with satellite TV, sofas and a small table with 4 chairs. Induction hobs, electric oven, microwave, dishwasher, American fridge with freezer, second small fridge, fruit squeezer, Nespresso machine, blender, toaster, kettle. Swimming pool (salt water) 8m x 5m, pool stairs in masonry. Table for 8 people with chairs. Chairs and chairs for 8 people.